May the Lord be generous in increasing your love and make you love one another and the whole human race as much as we love you. And may he so confirm your hearts in holiness that you may be blameless in the sight of our God and Father when our Lord Jesus Christ comes with all his saints. Finally, brothers and sisters, we urge you and appeal to you in the Lord Jesus to make more and more progress in the kind of life that you are meant to live: the life that God wants, as you learnt from us, and as you are already living it. You have not forgotten the instructions we gave you on the authority of the Lord Jesus. Jesus said to his disciples: "There will be signs in the sun and moon and stars; On earth nations in agony, bewildered by the clamour of the ocean and its waves; people dying of fear as they await what menaces the world, for the powers of heaven will be shaken. And then they will see the Son of Man coming in a cloud with power and great glory. When these things begin to take place, stand erect, hold your heads high, because your liberation is near at hand. "Watch yourselves, or your hearts will be coarsened with debauchery and drunkenness and the cares of life, and that day will be sprung on you suddenly, like a trap. For it will come down on every living person on the face of the earth. "Stay awake, praying at all times for the strength to survive all that is going to happen, and to stand with confidence before the Son of Man." Bodily drowsiness is a sign the body need recuperative sleep. Jesus alludes to a more serious drowsiness in this Sunday's extract from Luke (ch.21) when He told his disciples: "Beware that your hearts do not become drowsy …". For a person with faith in God it can be tempting to imagine that she or he is living in a religiously settled situation with regularity of prayer, attendance at Sunday Mass, participation in fora for justice, charity etc. Satan cleverly makes use of what is to hand on a daily basis, as well as capitalizing on moments of weakness. Routine and regularity can induce a form of drowsiness of heart where it is tempting to imagine that all is well. In reality, whenever our spiritual alertness lessens, we become more susceptible to distracting temptations. These can wear us down imperceptibly as a drip of water can eventually wear away the surface of a stone. Distracting but nevertheless engaging temptations can be identified and addressed with the help of good spiritual direction and whatever behavioural reform is agreed upon. Unless such temptations are tackled, they can lead to a growing disgruntlement in much the same way that food particles remaining in the teeth, despite daily brushing, can be the cause of decay. The first steps in losing one's faith are most frequently not major disagreements with the Church or, less likely, with God but inattention to the seemingly small but persistent and potentially deadly inroads made by Satan. Faithfulness in regular prayer and practice falters and eventually slips on a compromised decline. So many Baptised do not so much storm out of communion as float gently away on a tide of decline leading to an eventual disintegration of our religious purpose. Every Christian needs to live in a permanent state of expectation. While the thought of my Guardian Angel being on my right shoulder may be comforting, I need to be aware that Satan is hovering all too near my left shoulder. For this reason, Christians need to welcome and utilize the annual season of Advent. 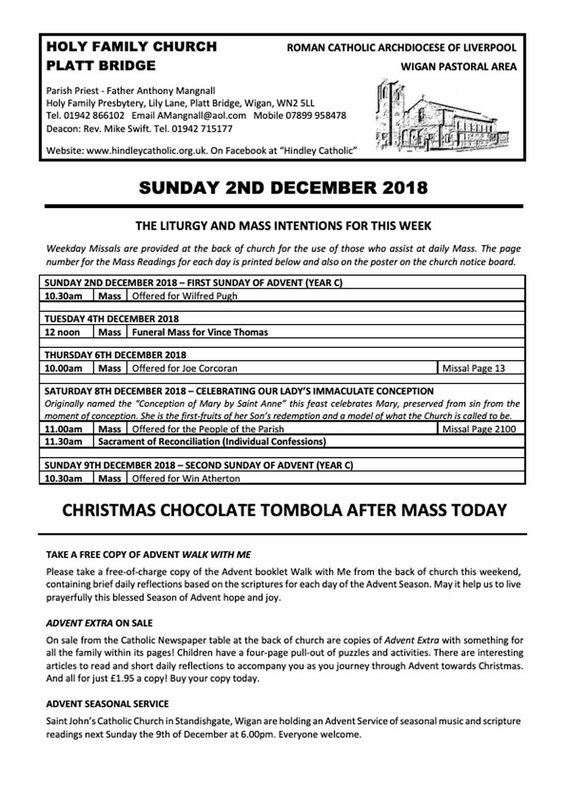 Have you stopped to consider how and why the four weeks of Advent have been swallowed up and disappeared, over time, by the alluringly deceptive 'malls' of Christmas shopping whether on-line or in the high street? It is neither by accident nor the avariciousness of unchecked commercialism that this has happened. Advent has been overlaid by Satan who, most certainly, does not want Christians alert and expectant. He prefers people to be shopped-out and living in an alcoholic blur. Have you experienced the wonder of standing, on a mountain, above the cloud-line with the sun high in the sky? Rolling away beneath your feet, as far as the eye can see, are the brilliantly white undulating, uninterrupted tops of the clouds. You almost feel that you could step out on to them! In such a location, on a windless day, there can be a quality of silence and stillness unparalleled at ground level. This is the last possible experience that Satan wants us to have for, in such a stilled silence, we are open to the delicate call of God. Our hearing of God's call, Satan will do everything in his considerable power to mask. Satan makes use of noise, sensation, reverberation, vibration, pollution to overlay our appetite for the beauty of stilled silence. In this 21st century, as never before, we carry around in our pockets and ears all manner of devices to assist Satan and many do not even know they are doing so! Some, reading this may wryly smile and say "Rest! Is he mad! There are only 23 shopping days to Christmas!" Precisely! Satan is working so hard to make people exhausted both emotionally and financially. He has absolutely no thought for our spirituality being silently, but all too efficiently, suffocated. "… stand erect and raise your heads because your redemption is at hand." "Beware that your hearts do not become drowsy from carousing and drunkenness and the anxieties of daily life, and that day catch you by surprise like a trap." "Be vigilant at all times and pray that you have the strength to escape the tribulations that are imminent and to stand before the Son of Man." How we choose to respond is a personal decision but, if I may suggest, it is easier to make a whole-hearted response with the support of others. 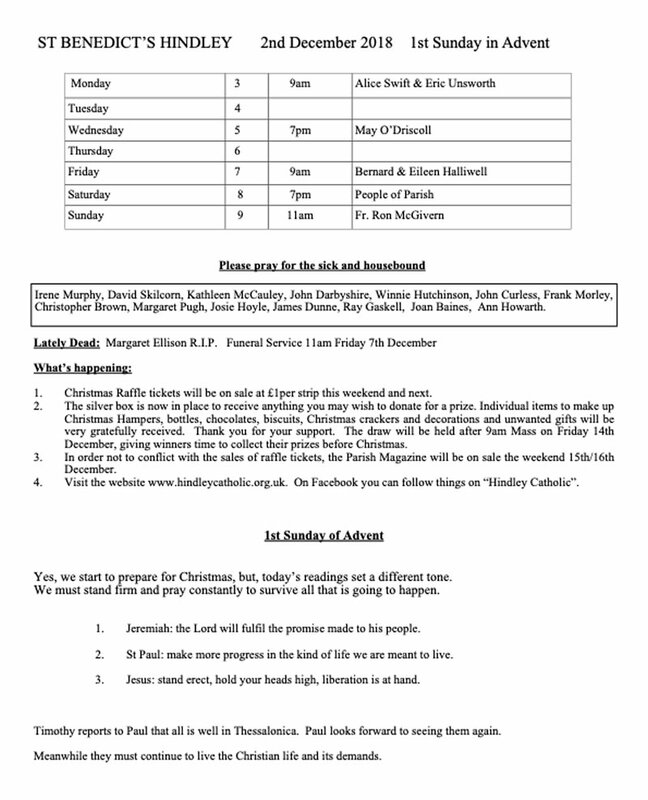 Why not ask family members, especially the younger members, to compose a 'family Advent prayer'? After all, nobody knows your family's needs better, save God. Adults should resist the temptation to make it 'correct' or 'appropriate'! God knows what the authors intended even if the punctuation is not of 'A' level standard. Make use of it daily, together if possible. 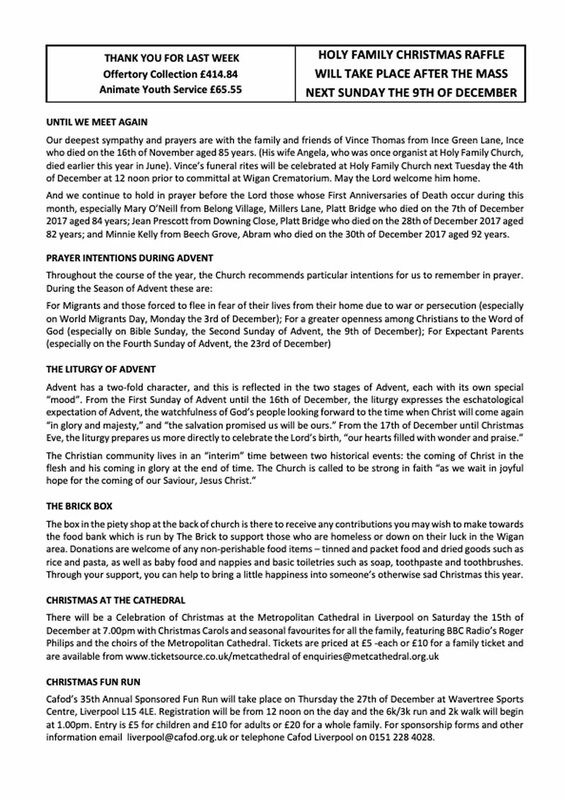 Why not think of drawing any elderly Christian neighbours into your prayer by offering them a copy of your prayer and inviting them to join you, from their home, when you pray it as a family? If you were really adventurous, try turning off all devices for ten minutes and holding the resulting silent-stillness (ignoring the doorbell) for ten minutes. Then share your prayer. It does make a difference - you hear each other differently. Bring Advent alive and by reinvigorating your belonging within the family of Christ on earth.